Comments: Belle Haven is a Victorian residence built ca. 1880 for an English family named Clark; Captain John L. Pitts bought this home around 1900. 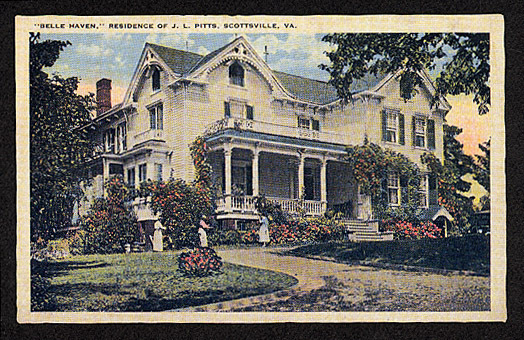 Belle Haven sits on 46 acres of land overlooking the James River at Scottsville. Some of its unique features are richly decorated vergeboards in its gables and Tiffany glass windows. According to The Scottsville Sun, dated November 8, 1951, Belle Haven's "wide archways, large rooms, stained glass window decorations and large porches are reminiscent of days when the home was the heart and center of family life, and economy of space and time was not of such importance." This Burgess postcard is part of the Kathleen (Phillips) McNamara collection. Kathleen resides in Scottsville and is the granddaughter of Captain John Lee Pitts and Helen Amanda (Burgess) Pitts. Kathleen also was born at Belle Haven in the second floor bedroom that overlooks the front veranda.